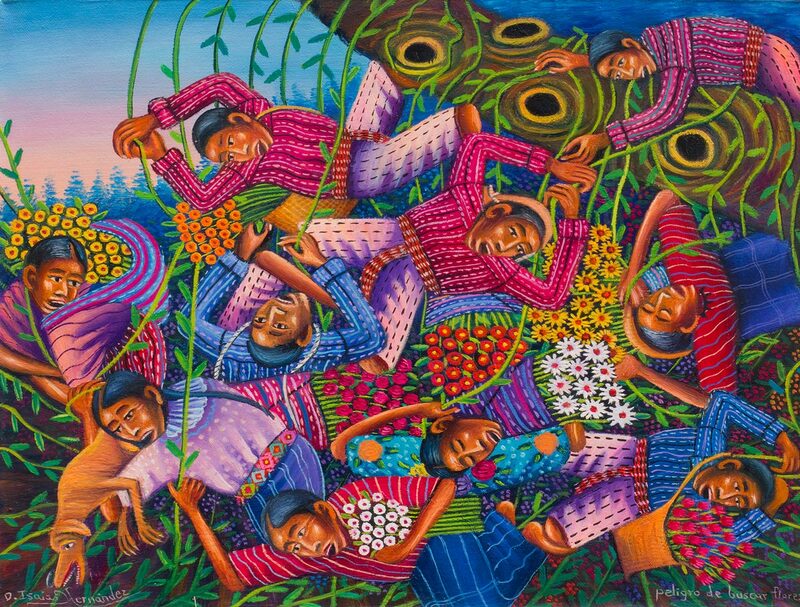 The Fall newsletter covers the wonderful creative output of some of the indigenous artists and weavers of Guatemala and the struggles to improve the lives of the Maya in Guatemala. 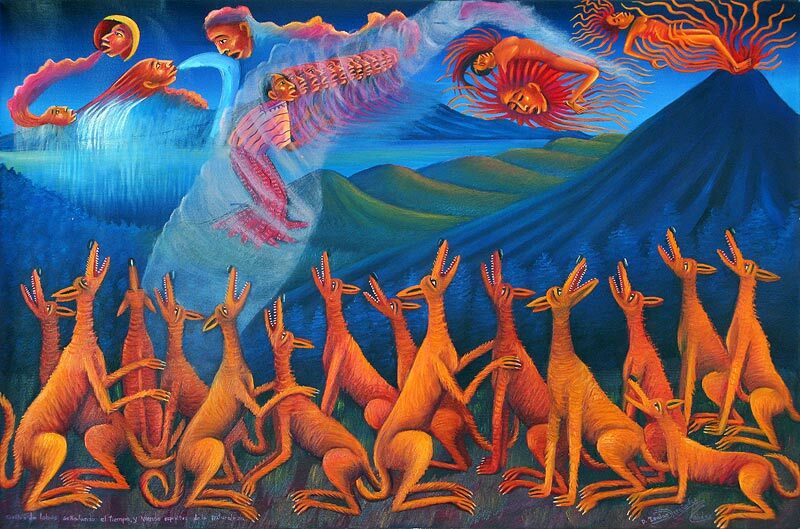 Diego Isaias Henandez Mendez is one of a handful of Tz'utuhil Maya artists who I work closely with. His work is unique and easily identifiable. 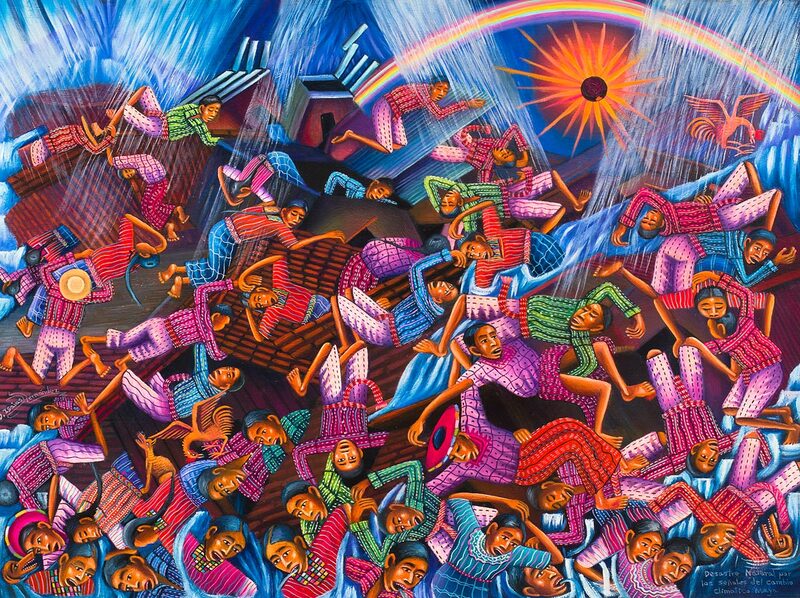 He became famous in Guatemala for his depictions of accidents and natural disasters, but he has branched out to include themes representing Maya spiritual beliefs. In these paintings animals often are able to see the spirits of the sun, moon, wind, and mountains. 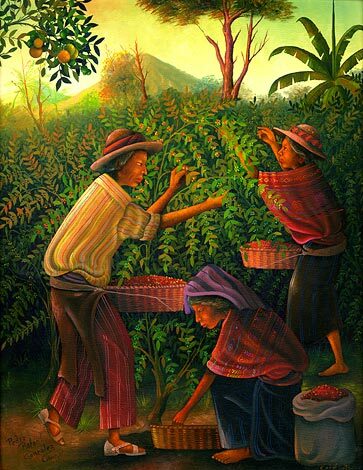 Diego Isaias is not a traditional oil painter; he is more like a cartoonist working in oil. 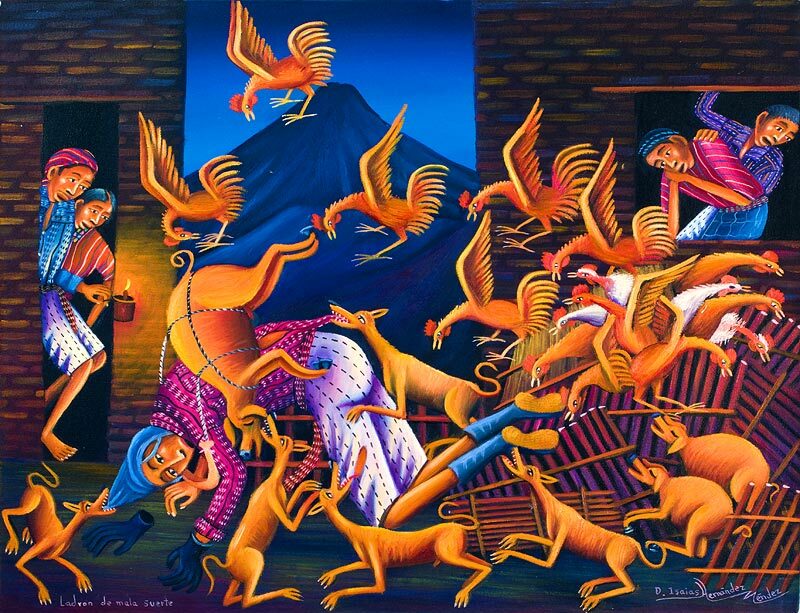 His paintings are often humorous, and no other Maya artist captures movement as well as Diego Isaias. 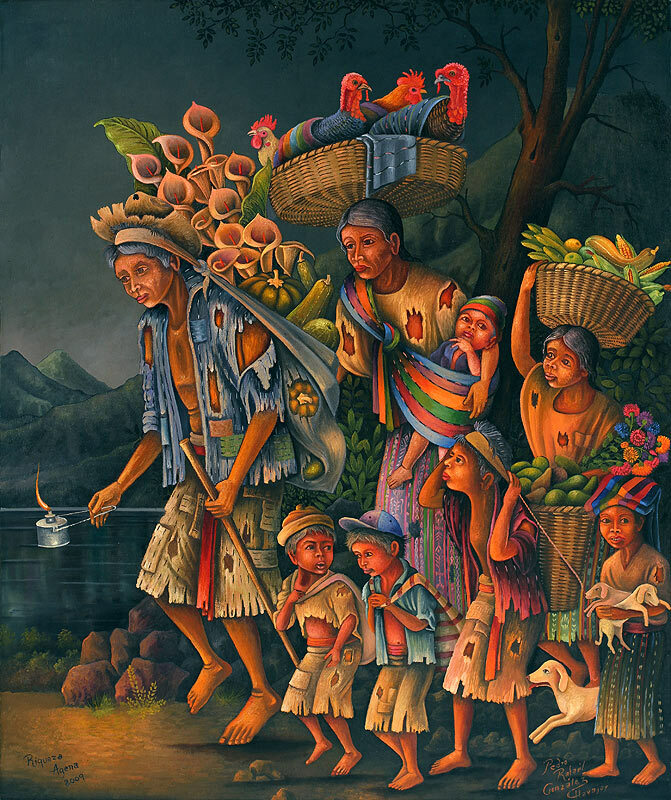 Every painting he does is unique, something to be concerned about in the indigenous Maya popular painting market where most of the young artists have found that they can earn more money doing endless duplicates of their most popular paintings. While cataloguing and photographing Diego Isaias Hernandez' most recent paintings, I discovered that I had been sitting on quite a number of paintings by Diego Isaias that I had never put up on the website. In order to reduce my inventory, I am offering them at 40% off until November 29 (Black Friday). The article which follows is from the April 4, 2014 edition of La Prensa Libre. 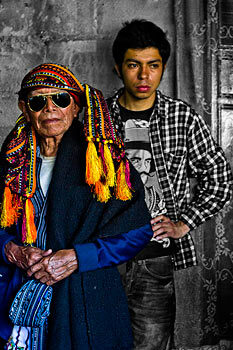 It was written by Benvenuto Chavajay, a young and influential conceptual artist from San Pedro la Laguna. Chavajay and Pop were honored with a special exhibition during the Biennial de Paiz, Guatemala's most important cultural and art event. I doubt that the incredible work of Feliciano Pop would have been included without the support and recognition given to him by Benvenuto Chavajay. "People who understand art create peace for their hometown," they say of Feliciano Pop an indigenous artist who was born the 29 of September 1929 to a humble campesino family in San Pedro la Laguna in the Department of Sololá, Guatemala. Feliciano Pop is a unique and multifaceted person, who was Mayor of San Pedro in 1985, during which time he revived the most famous of the traditional masked dances, The Dance of the Conquest. He detests lies and falsehoods, and for this reason he says he always wears the handwoven attire of his town. Pop Discovered his love of making art at an early age. 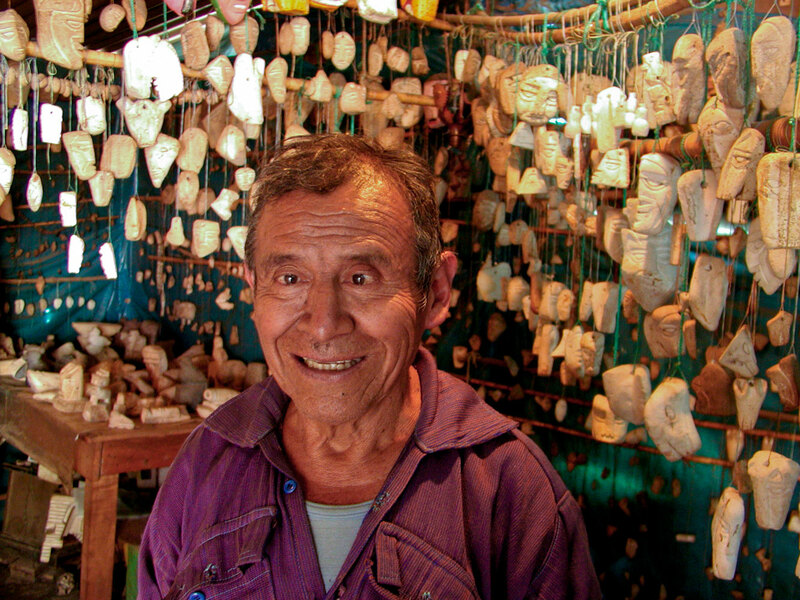 As a child in elementary school he carved his first figures out of pumice, which he calls "lake rock," and was helped by teacher Rafael González y González, the first oil painter of San Pedro la Laguna, and the entire region of Lake Atitlán. Gonzalez recognized that Pop was a gifted child. After that Pop made a promise to commit himself full time to the task that he describes as "removing what is outside the rock," which in his Maya Tz'utuhil Maya language is called josol'alas—sculptor. No one can estimate how many rocks have received color and form in his hands. Neither is it known to how many countries tourists have carried the carvings that they bought. Feliciano has saved some of the first objects that he made, like a ball from his childhood made of cloth when there were not balls made of plastic, much less any other type of toy. "I sewed this ball from cloth and played with other children." he said. Since then he has known no limits in believing and creating to give life to his imagination. His life is a museum where, like stars impossible to count, hang the carved rocks—one of them in the form of a military tank with faces in the place of caterpillars—but also out of other materials, like the seed of a mango made into the form of a monkey, plastic bottles made into whimsical figures, effigies out of animal bones. Benvenuto (Nuto) Chavajay reconfigures common everyday objects in his art that make viewers rethink their relationship to them. 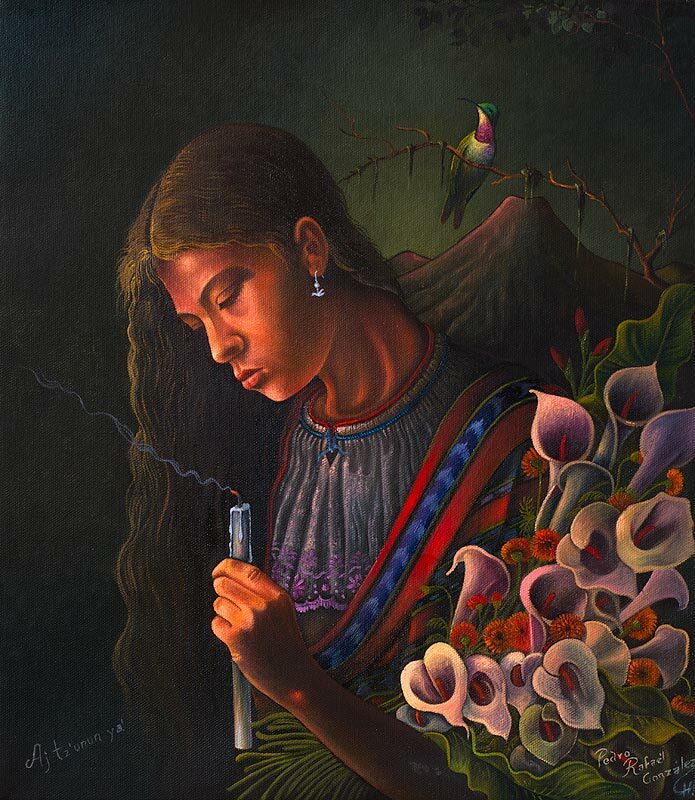 His works often represent the relationship between the indigenous Maya people to the government. 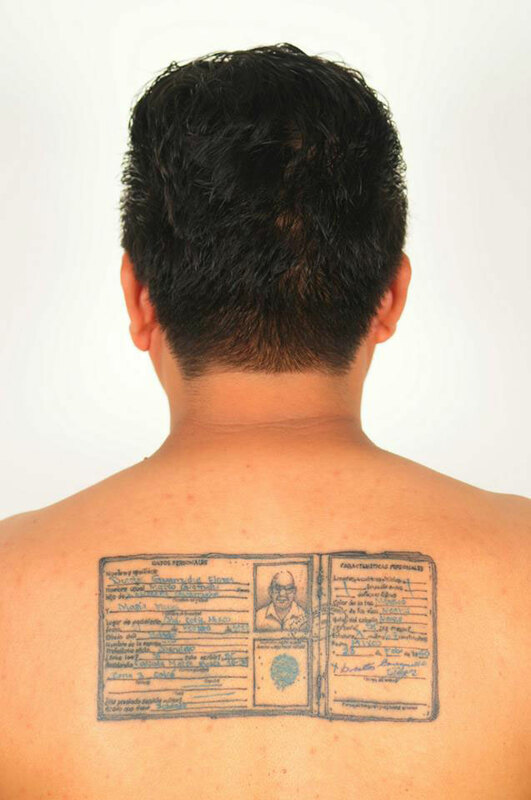 In a YouTube video, Nuto has the original Tz'utuhil Maya form of his surname ch'ab'aqjaay (ch'ab'aq: muddy, wet, humid; jaay: house) tattooed to his chest at an exhibition opening at the Jameson Gallery in Durham, NC. The photo at right shows a man's back tattooed with the image of his cedula, the most common and important piece of ID in Guatemala. It has a photo of the person along with the names and places of birth of both parents. 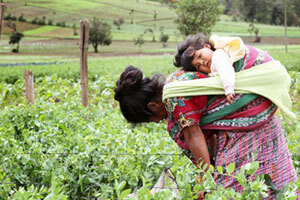 Over the past couple of years the PBS News Hour has done a number of segments on malnutrition in Guatemala. Studies show that malnutrition during the first two years of a child's life can affect the child's growth throughout their life. In a land of plenty, a reporter's snapshots of malnutrition This is the most recent report, and has many photographs including the one above. How Guatemala finally 'woke up' to its malnutrition crisis. Another recent article with photographs highlighting NGO's work in confronting the problem. When Maya women in Guatemala talk about the art of weaving with a backstrap loom, they often speak in terms of birth and creation. The loom, a simple assembly of sticks, rope, and strap, joins the weaver and her life-giving energy to the yarns of her work. As the artist leans back and forth with the backstrap around her hips, she weaves the lengths of yarn together, and the fabric takes form. When complete, it identifies her community and expresses life itself through its design and decorative motifs. Beginning September 16, the Spurlock Museum celebrates the artistry, diversity and endurance of the Maya weaving tradition in the exhibit Artists of the Loom: Maya Weavers of Guatemala. A total of ninety-three textiles provide the broad cultural and geographic scope of the exhibit, with eight distinct Maya languages, thirty-two highland towns, and eleven governmental departments represented. In addition to the display of individual objects, eight complete outfits will be displayed on mannequins. Six topics are highlighted in Artists of the Loom: links between the living Maya and their ancient ancestors, the significance of the backstrap loom, ceremonial cloths and clothing, daily wear, the art of the traditional Maya blouse, called a huipil, and the evolution of huipil design. Woven throughout the exhibit is discussion of the enduring influence of ancient tradition in spite of invasion, conquest, political conflict and the tastes of modern collectors and dealers. The textiles featured in Artists of the Loom were selected by guest curator and scholar Margot Blum Schevill, author/editor of several books on Maya textile traditions. They were chosen from among the 790 articles of clothing and adornment she reviewed and recommended to form part of the Museum’s extensive Kieffer-Lopez Collection. Each piece reflects the deep appreciation for and knowledge of the Maya weaving tradition that the collector Margaret “Peg” Kieffer developed over a period of more than thirty years, beginning in 1972 when she first traveled to Guatemala to conduct research for her Ph.D. Guest curator Margot Blum Schevill and ethnographic photographer Jeffrey Jay Foxx will present a program of reflection upon images, memories, and knowledge gained in more than three decades of work among the Maya. Free admission. 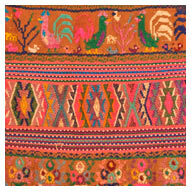 Artists of the Loom: Maya Weavers of Guatemala is free and open to the public during Museum hours through January 25, 2015. Museum hours are the following: Tuesdays 12-5; Wednesdays, Thursdays, and Fridays 9-5; Saturdays 10-4; and Sundays 12-4. The Museum is closed on University holidays. The Spurlock Museum is located at 600 S. Gregory, Urbana. For more information on the exhibit, contact Tandy Lacy at 217-244-3900 or annlacy@illinois.edu. For information on the Museum, contact Kim Sheahan at 217-244-3355 or ksheahan@illinois.edu. 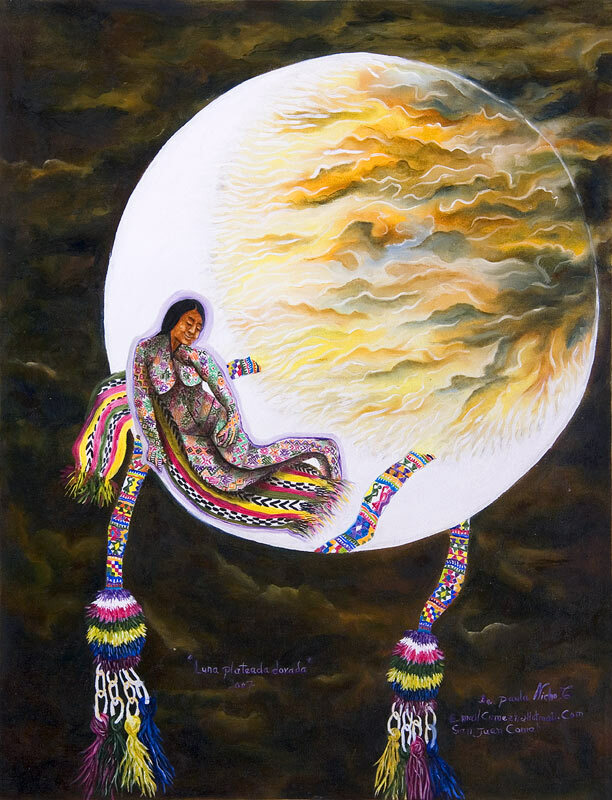 Exclusive to Arte Maya Tz'utuhil are posters of paintings by Paula Nicho Cumez and Pedro Rafael Gonzalez Chavajay. The posters sell for $15 each and are 12" x 18." 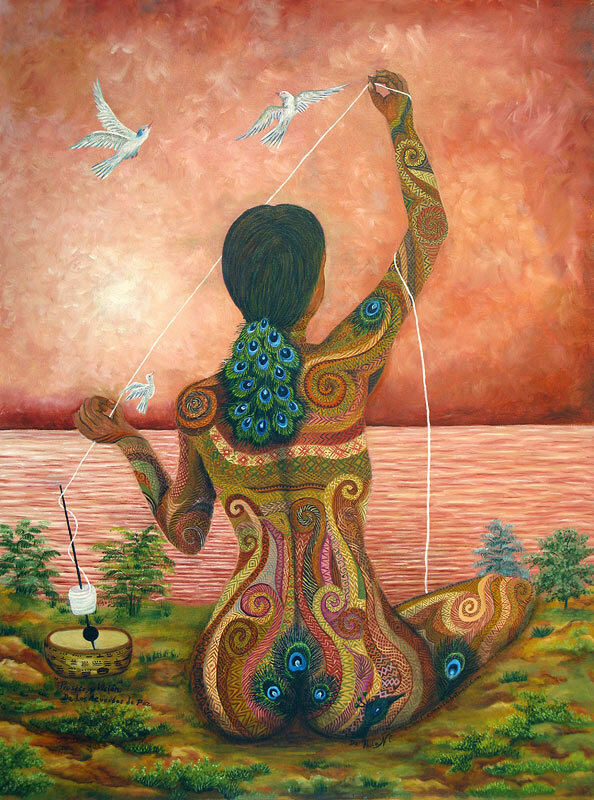 The sale of these posters helps Arte Maya Tz'utuhil support the artists. How Guatemala finally 'woke up' to its malnutrition crisis.